Great Benefits of Fresh Ginger Carrot Juice You Should Know! The enlargement of the fast food industry directly affected the people`s habits of eating healthy food. Sadly, less and less people consume healthy food nowadays. Fast food is maybe tastier but you should bear in mind that it is harmful and it leads to various health conditions. We offer you a list of 4 health benefits that fresh ginger carrot juice has and you will hopefully include this healthy option in your diet. Carrot ginger juice is highly beneficial due to the fact that it is loaded in vitamin C and vitamin AA. 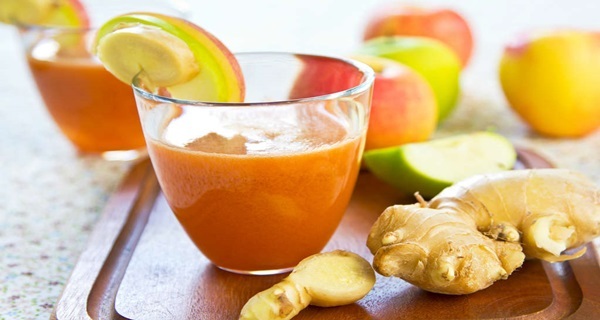 Only one cup of this juice provides the entire recommended intake of vitamin A and 15 miligrams of vitamin C.
The ginger juice contains gingerols which react with angiotestin 1 and angiotestin 2 type receptors. According to a study published in 2013 in Planta Medica, they are proteins that help in the regulation of blood pressure. The vitamin C has the ability to keep the skin strong and to heal wounds. In addition, the production of collagen is much effective when vitamin C is present. Apart from this vitamin, the carrot ginger juice contains vitamin E which naturally protects against UV sun rays. The fact that this juice is rich in vitamin C it makes it a natural way to fight cancer. The vitamin C effectively reduces the risk of breast and stomach cancer. According to a study published in 2012 in the “European Journal of Pharmacology”, the gingerols mentioned above, accelerate the death of ovarian cancer cells. Next post: 4 Ways to Flatten Your Belly! Previous post: Powerful Super Food Is Barley Grass Which Can Save You From Many Diseases! See How!